The simulated car is built from several modules which map to sub-systems on the real car. Each module can be saved as a separate file for reuse in different simulations, and you can save and restore all the modules and settings you use for a particular simulation in one operation, making it easy to manage your work. The major modules are described below but note that new modelling features are added on a continual basis - contact Ansible Design for the latest specification. You can define each module using the built-in user interface or programmatically through the ActiveX interface. 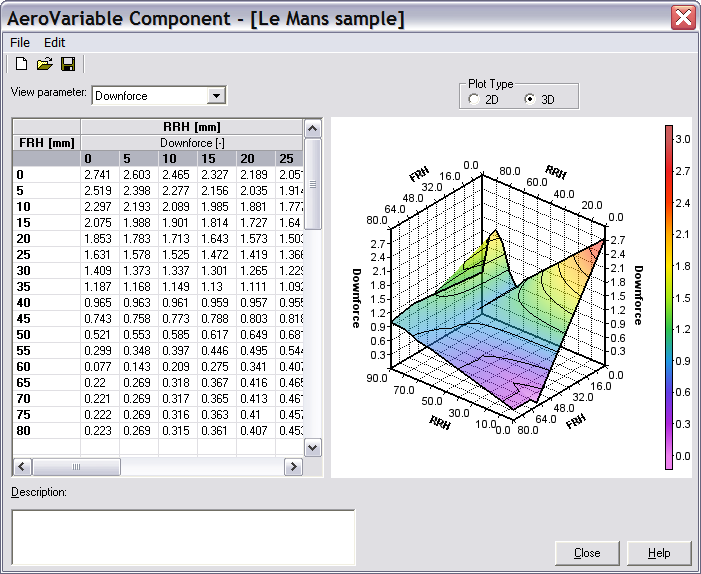 This makes it easy to link AeroLap simulations to other tools you may have, for example MATLAB models or Excel spreadsheets. Aerodynamic values can be fixed or fully ride height dependent, taken from an aero map file of lift, drag and balance as tabulated functions of front and rear ride height. AeroContour will create correctly formatted aero maps from arbitrary, scattered data aero data points. 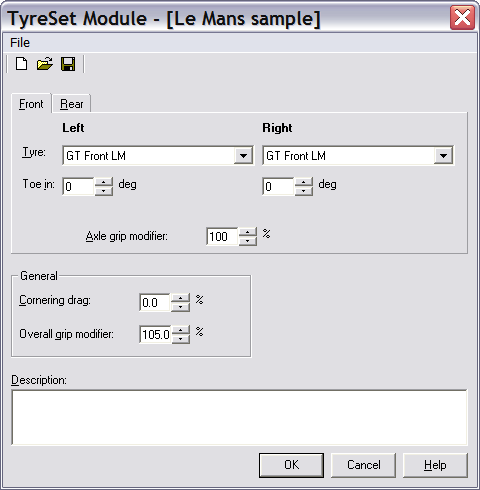 This map can include front wing performance - the front wing angle can be entered directly and the resulting change to overall aero values automatically calculated. The aeromap can be viewed as a 2D or 3D contour plot. In 3D mode you can spin it with the mouse to see its shape. 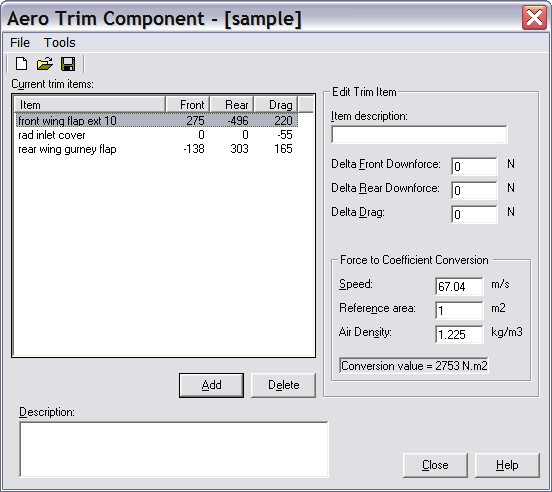 The aero trim can also be changed by selecting named items from a user-defined trim file. These features make changes to the aerodynamic setup very quick for race engineers, without the need to look for extra data in other places. 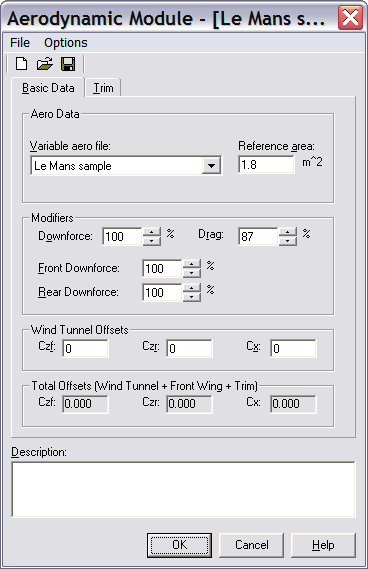 Separate wind tunnel offsets can be entered to correct for wind tunnel-track differences. For what-if studies and simulation adjustment the frontal area can be changed and lift and drag values scaled independently from the reference values. 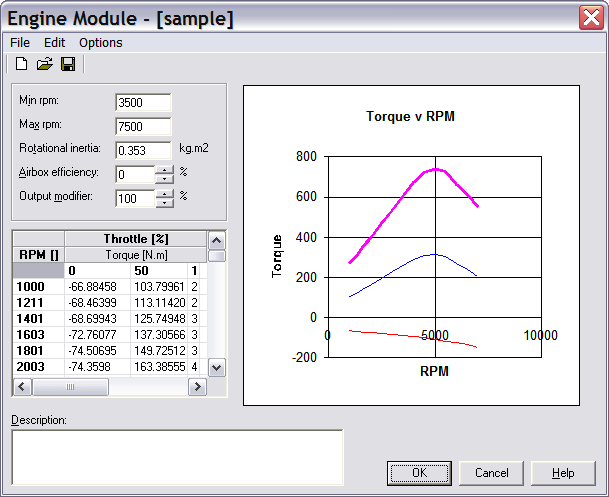 The engine model uses a graph of steady state output which can be entered as either torque or power. Multiple curves can be entered for different throttle openings, with negative values at low or zero throttle. You can optionally define a different engine map for each gear. You can also optionally define different engine maps to be used at different positions on the track giving very fine levels of control over engine behaviour. As with all tables in AeroLap a graph is plotted as you enter values, making it easy to see the effect of changes. A rev limit, minimum allowed revs and engine rotational inertia can also be defined. You can scale the power output linearly up or down to see the effect of gross changes to engine performance, and model the effect of airbox efficiency on ram air pressure. 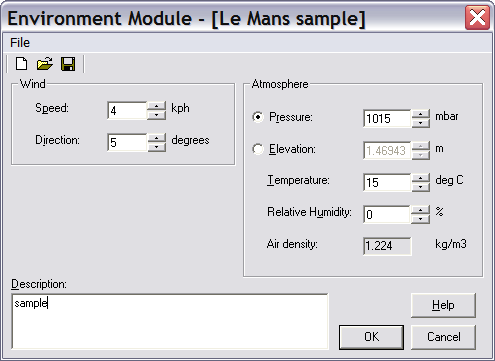 The engine model automatically accounts for atmospheric pressure defined by the Environment module. The gearbox can have any number of change gears up to seven, plus input, transfer and final drive gears. 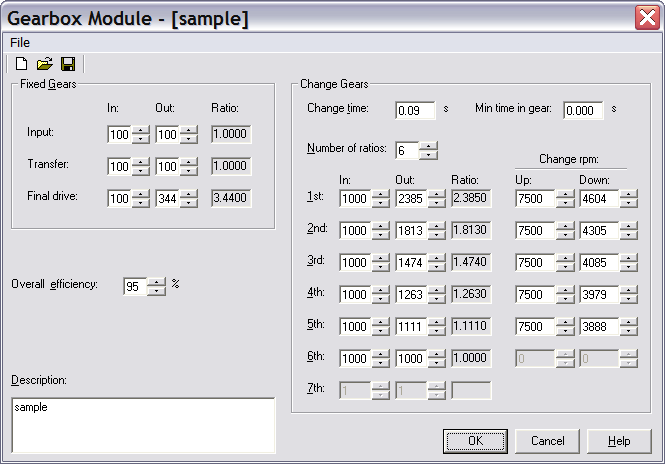 Each change ratio has separate change up and change down rpm values to control driver behaviour. Gears can also be set according to track position e.g. you can force a gear choice at a corner. You can also specify the minimum time to hold a gear, and the gear change time. A "lazy" gear change strategy can be enabled, which holds high gears as long as possible. The overall transmission efficiency can be defined. Tracks can be made from any number of straight or curved elements, from a couple to thousands giving highly realistic representation. Each element has its own bank angle, gradient and vertical radius (crests and dips). You can set a local grip factor so you can model sticky or slippery spots. You can force gear selection on particular sections of track. Graphical highlighting of selected track elements on the track map make quick local property modifications easy. 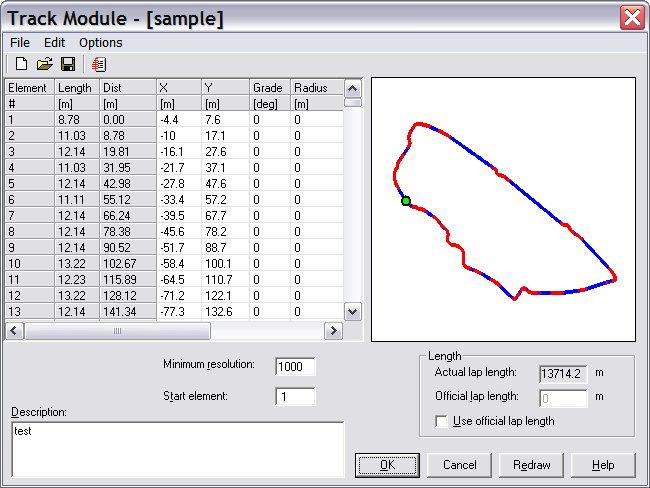 A track profile editor makes it straightforward to define banking and gradient around the track. The chassis model defines the masses and dimensions of the car. The car may be setup symmetrically or asymmetrically, with values entered for each corner. Values can be given for the car in a setup condition, e.g. 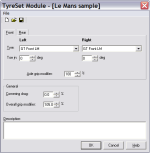 on setup wheels or without a driver, and then automatically modified to the race condition by entering offsets. 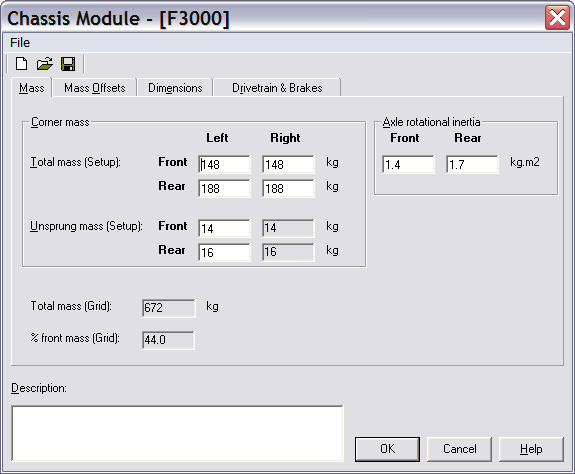 Fuel volume can be varied from the reference value and new static mass, distribution and ride heights automatically calculated. Driver behaviour can be altered, with braking and throttle pedal application rates. Brake proportioning can be fixed or ABS. The drivetrain can be FWD, RWD or 4WD. The suspension is modelled with anti-squat and dive angles; roll centre effects; static ride heights; bump and droop travel; spring and anti-roll bar stiffness and preload. Centre springs can be used. 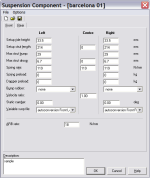 Most properties can be entered as fixed values, or as 2D tables varying with damper deflection and rack travel. These 2D tables can be generated from a set of suspension joint positions by AeroSusp, a separately available 3D suspension kinematics program. You can define non-linear, asymmetric steering characteristics, with bump steer and Ackerman effects. Non-linear bump rubber characteristics can be used. 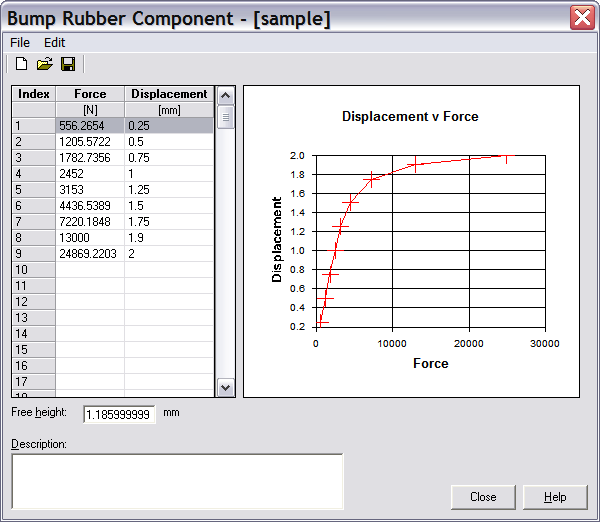 Once defined, variable characteristics or bump rubbers may easily be chosen from drop down lists of existing components. 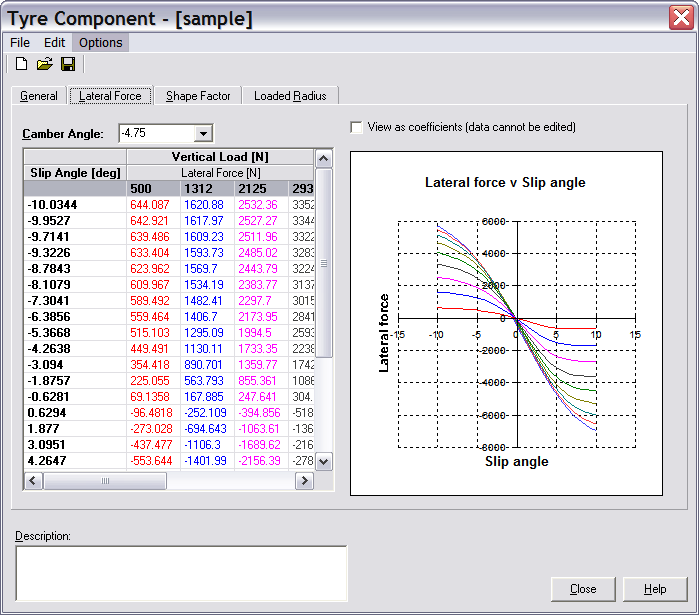 Tire grip characteristics are entered as a table of slip angle against lateral force and camber for multiple loads and camber angles. Only one load and camber must be provided if you don't have comprehensive data. The smallest amount of data to define a working tire is around 6 numbers. Fully detailed tires can use thousands of values. Combined grip is modelled with a variable aspect ratio friction ellipse that is a function of vertical load and camber. Load sensitivity is handled with a load dependent friction coefficient drop-off for out of range values, otherwise supplied values are used. Overall tire grip can be scaled up and down. You can also set local grip values in the track editor. 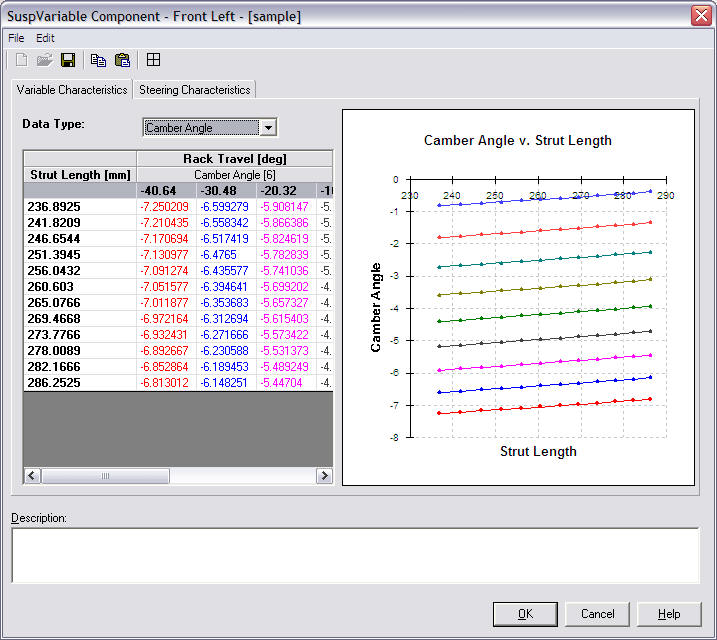 Tire stiffness and loaded radius data are used for overall vehicle load transfer and ride height calculations. Dynamic loaded radius can be modelled as a non-linear function of speed, camber and vertical load. Toe-in can be set front and rear. Grip can be varied per axle or globally, as well as by track position. A prevailing wind can be added to the simulation with a speed and direction. You can also set a different wind speed and direction for every element that makes up the track, if you want to model a variable wind field. Air density is calculated for you with inputs of humidity, temperature and pressure. This affects both aerodynamic and engine performance. If you are modelling an event you don't have pressure data for, for example a race coming up, then you can specify altitude instead and pressure will be found from a standard atmosphere model.